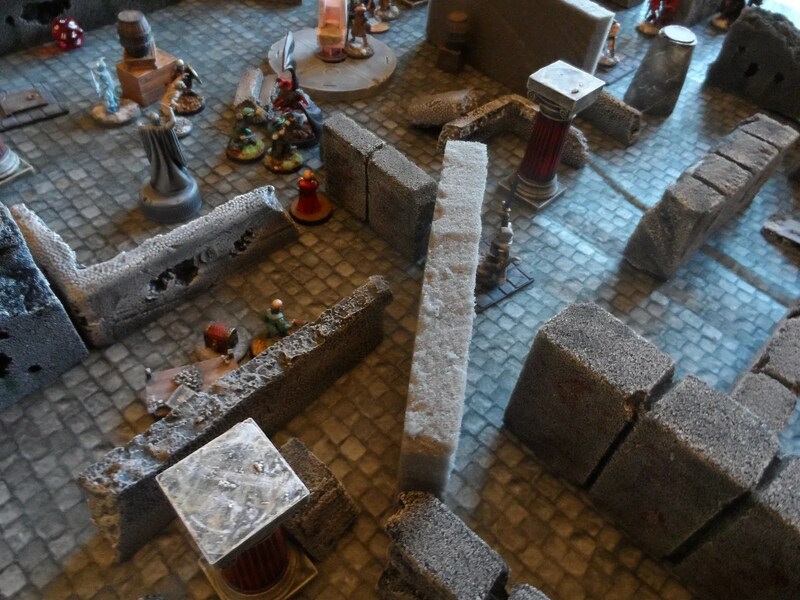 Foolishly, I have started to organise a frost grave session for the 29th December, and have hired the Burley Gate Village Hall, so if anyone in the vicinity of Burley Gate in Hereford fancies a game of Frostgrave, drop a comment here and I’ll be in contact. We have four players already lined up and 2 possibles, so we’re hoping for a straight head to head set of games in the morning and then a big board with all of us on it in the afternoon. 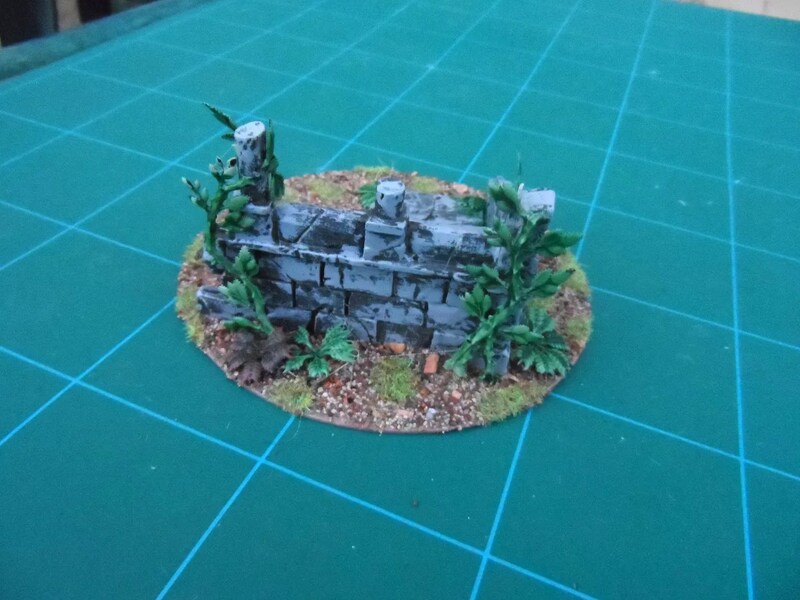 In anticipation of this event, I’ve been doing some more scenery and in particular getting some more Walls done, which has proved more difficult than expected. 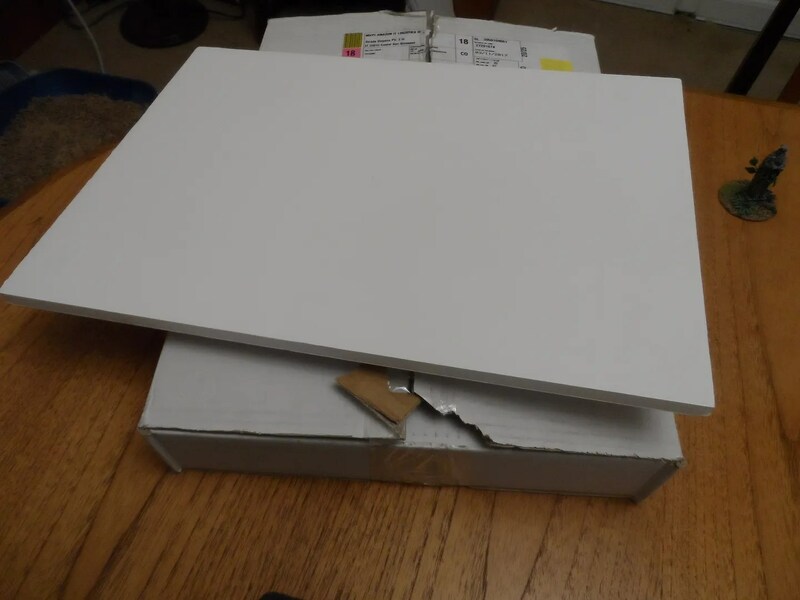 All I wanted was some foam board 10mm thick so that the walls stand up by themselves and don’t take up too much space. So I thought I’d hit the art shops for the foam board…. The Worcester art shop I used to use don’t stock it, and the head office couldn’t say when they could get it and deliver it to the worcester branch ! Hobbycraft said they didn’t stock it and wouldn’t order it in for me !! The Hereford art college didn’t stock it, and when I asked if it could be ordered in told me I couldn’t come in to it because of child protection issues !!!! No wonder high street shops are going out of businesss. The Amazon order I did late Monday and was delivered this afternoon. There’s no competition in terms of time cost and quality of service I’m afraid. Five A3 sheets in the box, so more than enough for another half dozen walls. 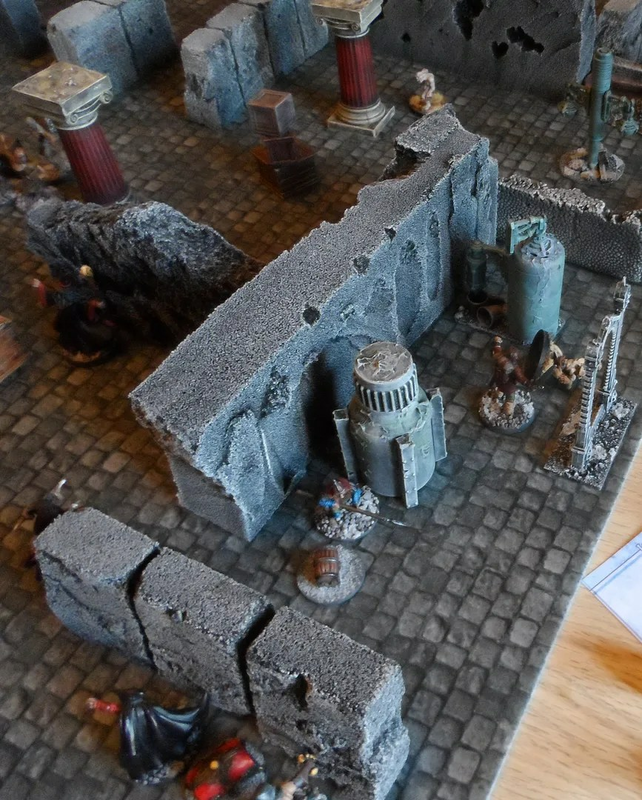 I might finally get round to the long promised tutorial on I did do that in making the foam board buildings ! 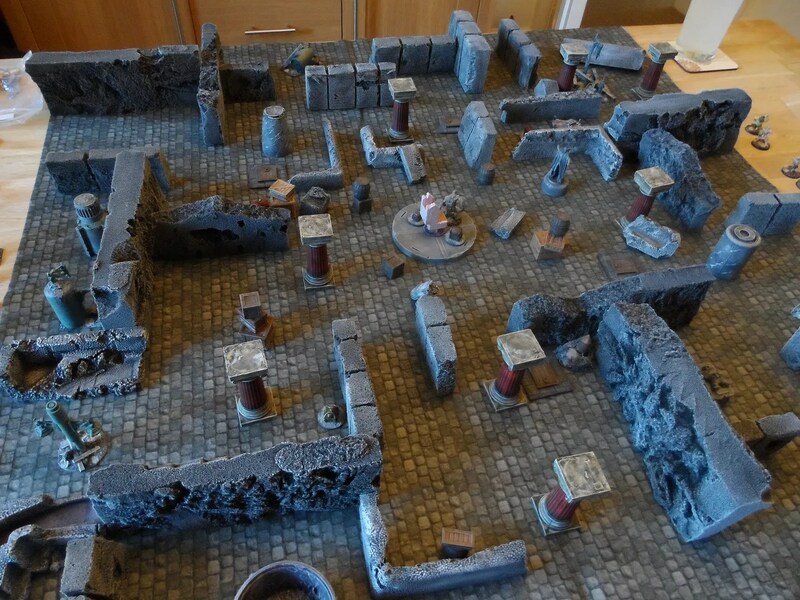 Whilst wading through another tranche of photos from Friday’s gaming session, and with a training course tonight (Data protection), I thought I’d throw some new photos of the scenery I’ve been working on. 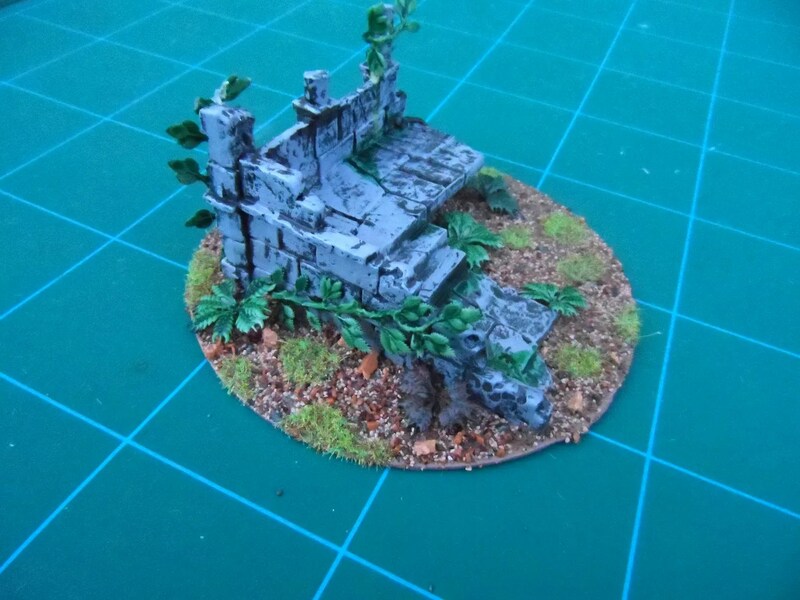 One of the GW Gondorian ruins pieces complete with creeping vines and ferns, also by GW on a CD scenery base. 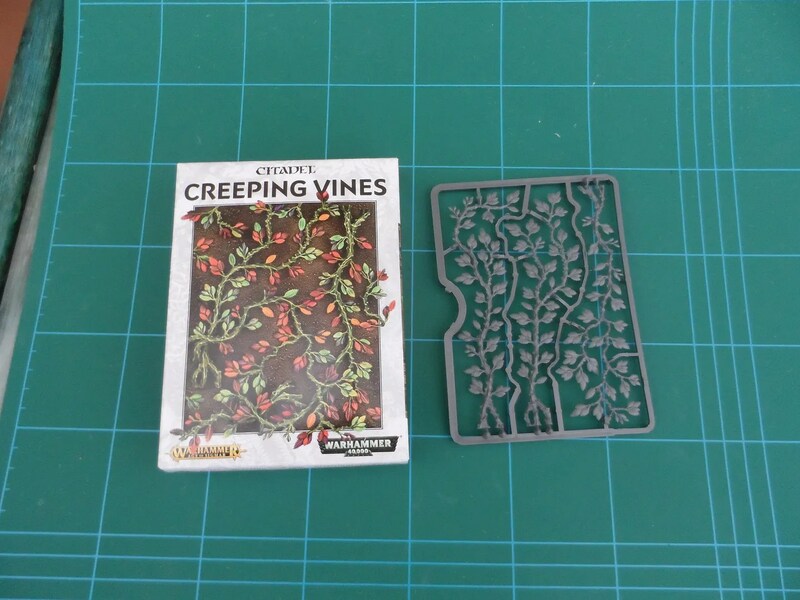 The creeping vines are again made out of the soft plastic the ferns are, and can be, with a little persuasion, be wrapped around scenery pieces. Makes it look good I hope ! 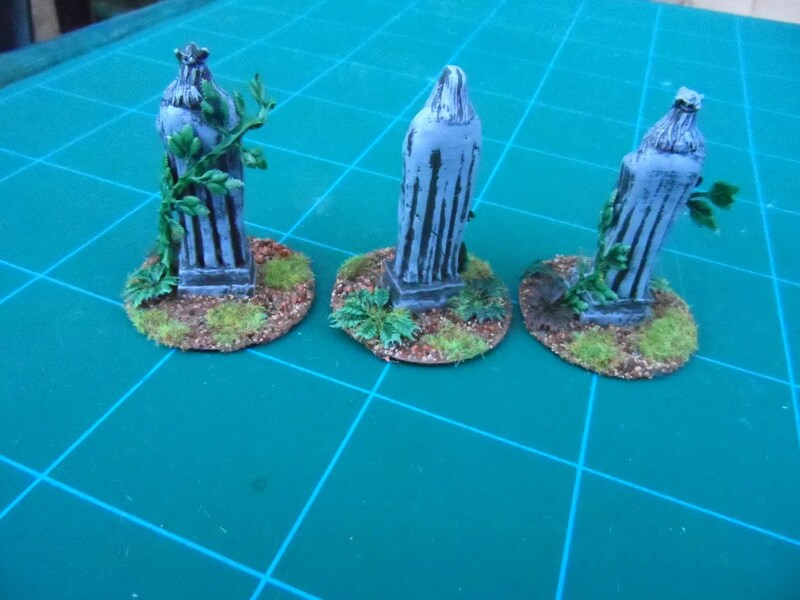 And of course some statues. 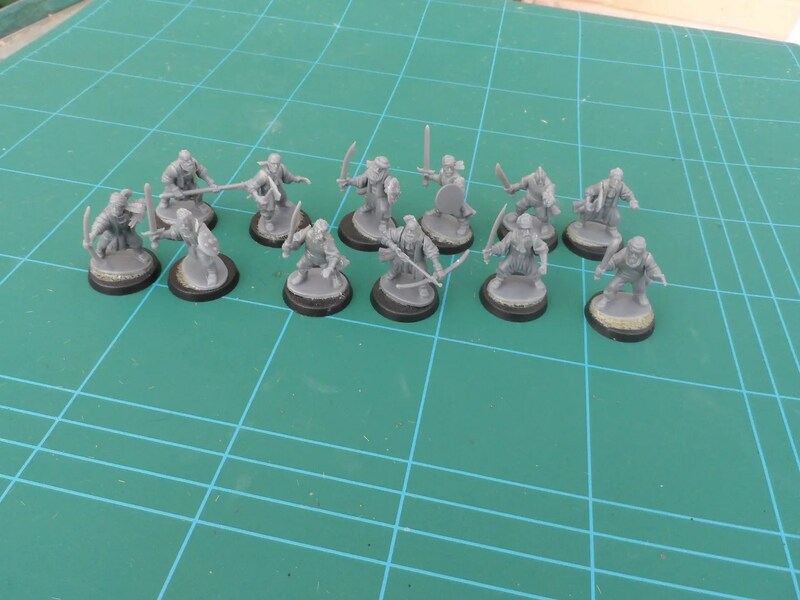 I bought the GW Gondorian ruins multi pack which is a really good bargain from the evil empire ! 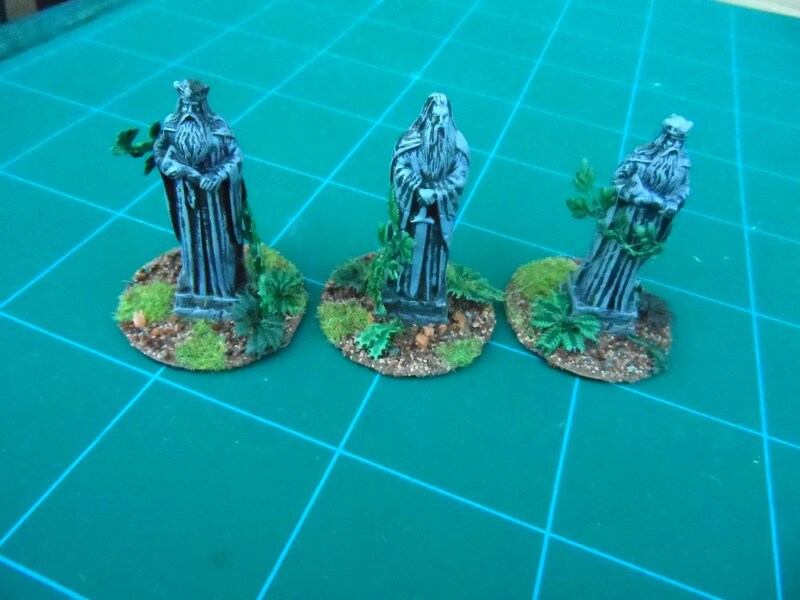 The new Ghost Archipelago crew plastics by Northstar. GW even squeezed out a freebie (!!!!! 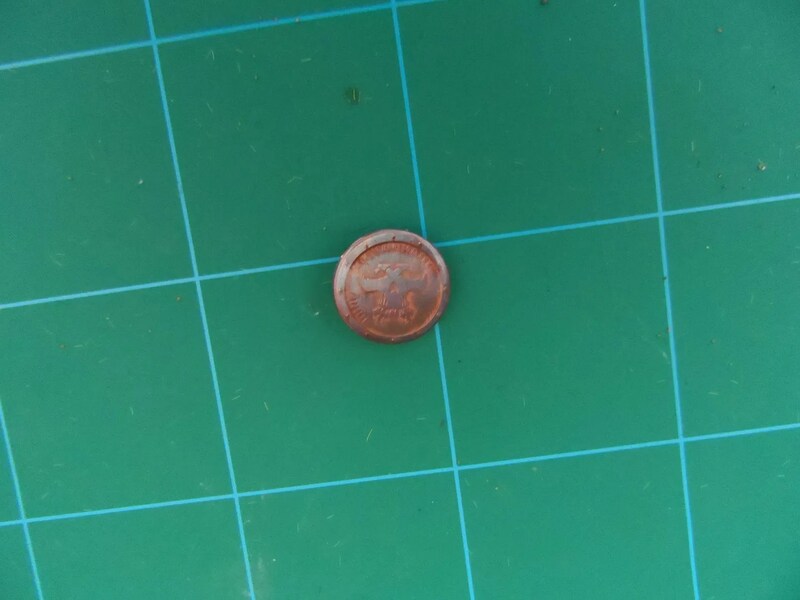 ), a badge with the WH40K logo on it. 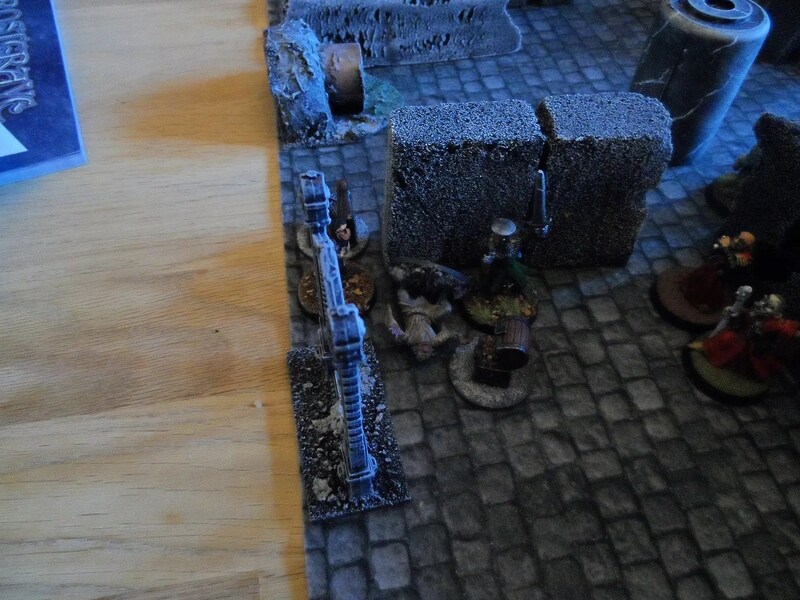 More ghouls were popping up, as my Captain pulled levers, but at least Thaddeus’ foul scum were busy. crunch ! 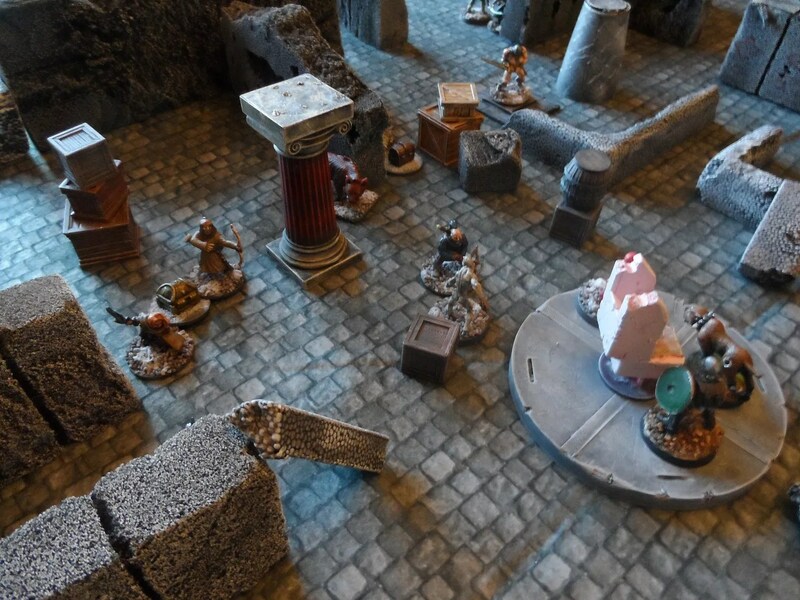 Another door was revealed – this time behind my lines, so now my treasure carriers were able to head for home. 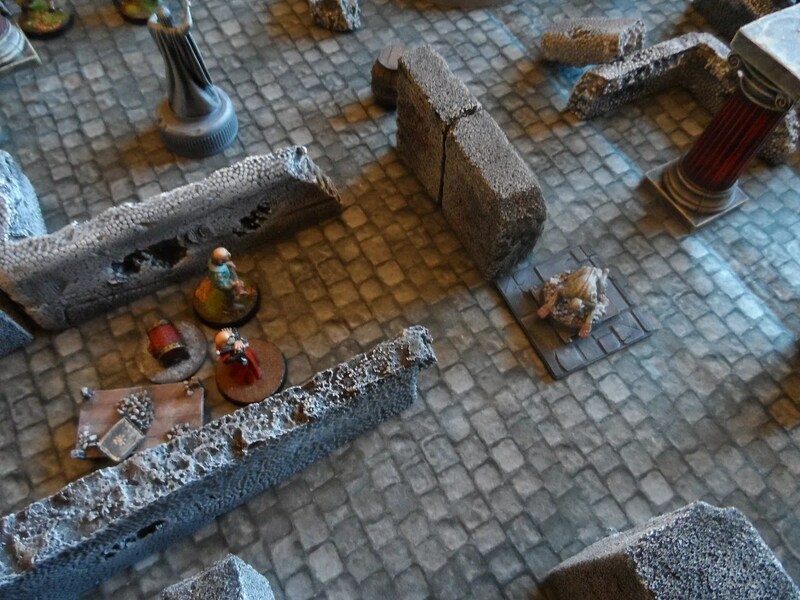 I dropped my second ghoul, right by the doorway behind Thaddeus’ monstrous hordes, but the ghoul did not last long, cut down by a treasure hunter. 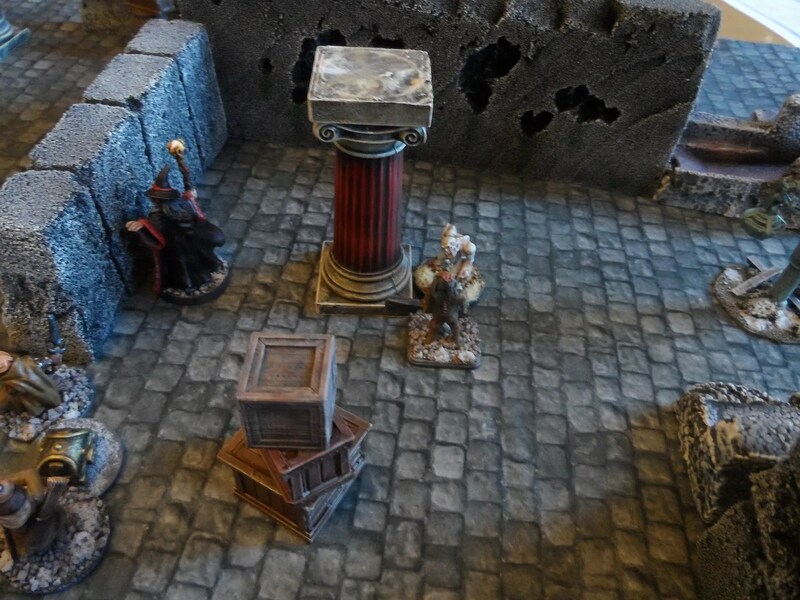 In my previous games session with Jim, I lamented the lack of Wall spells, so I had to use one today, to prevent aranger cutting my treasure toting thief off from his escape route. But even Elemental Hammer, did not stop a Ranger going down to the major demon. My Captain tried to escape, only to be caught by two ghouls and a frost wraith. You can guess the outcome ! More walls than O’Reilly can build. 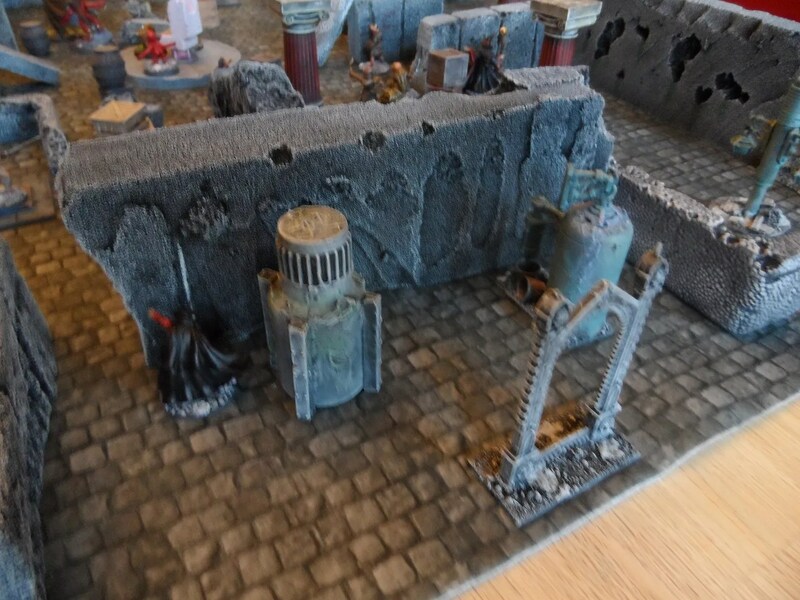 This covered my escape at the expense of a few meat shields, sorry, henchmen. Jon returned my earlier favour and dropped a ghoul right in front of my escaping treasure carriers, the knight however did for him. 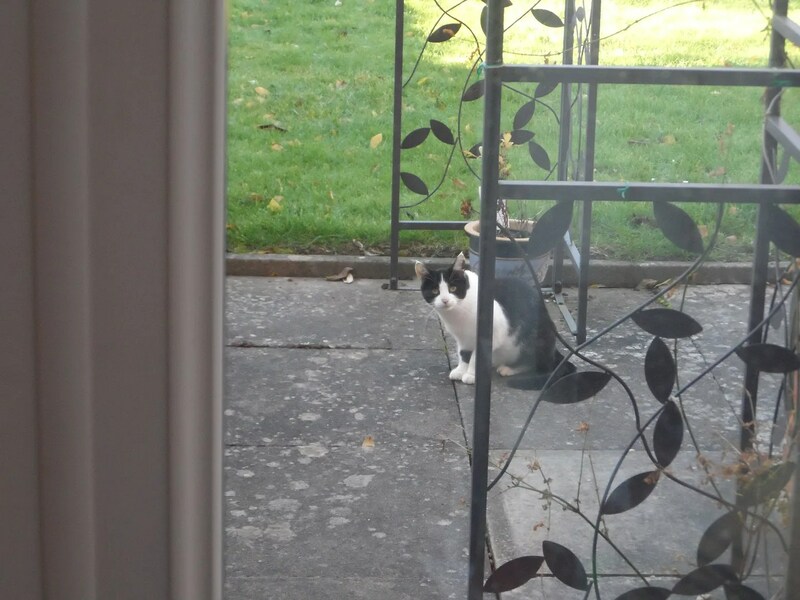 Creature Feature phase…and a Cat turned up ! 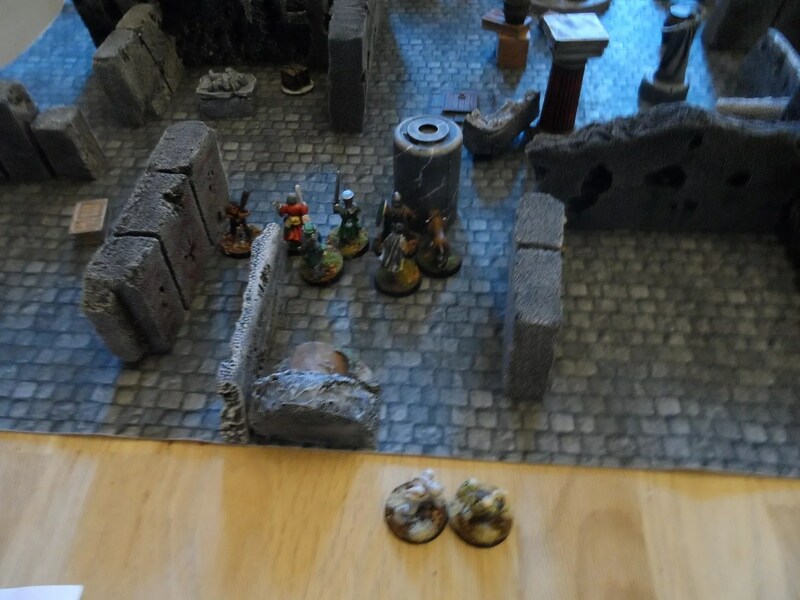 Meanwhile, more ghouls were killing Thaddeus’ minions, which was all well and good, as both of us had now suffered 3 or 4 casualties apiece. 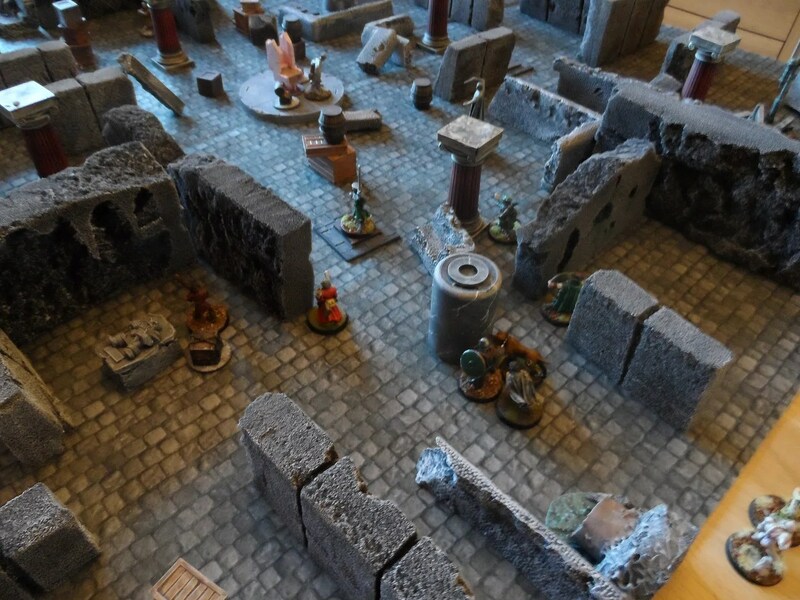 Surprisingly, we finished this scenario off in just over 2 hours ! 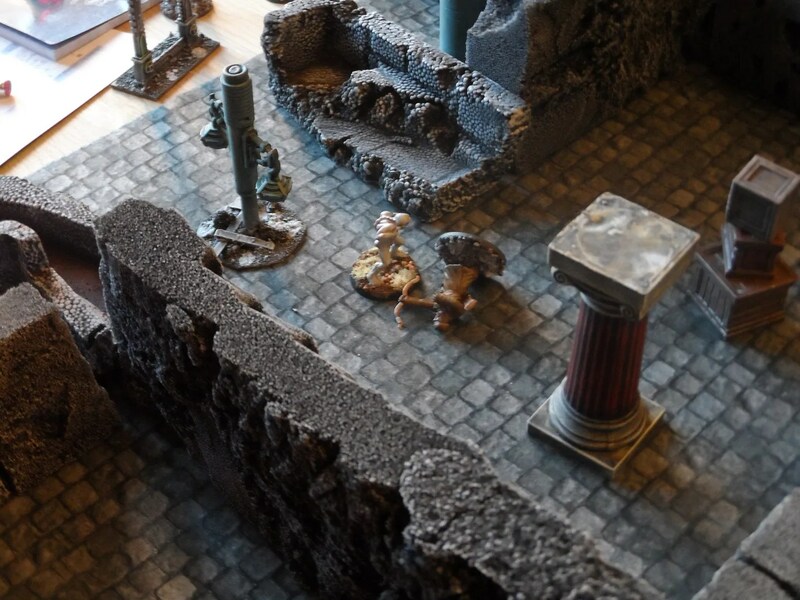 The multiple ghouls popping up caused a lot of damage and mayhem. 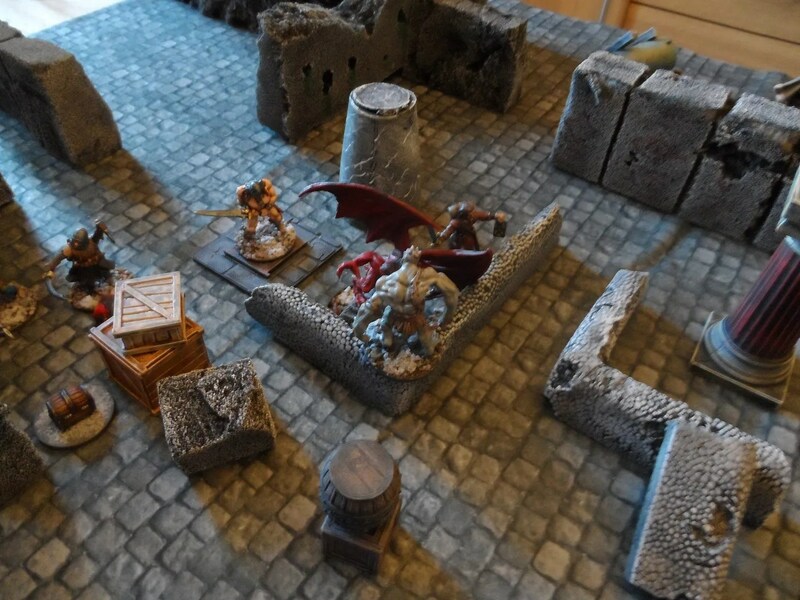 We forgot the frost wight was incorporeal, so it should have given me more grief, but I also found I’d completely forgotten to field my treasure hunter – so at least that evens the score up ! 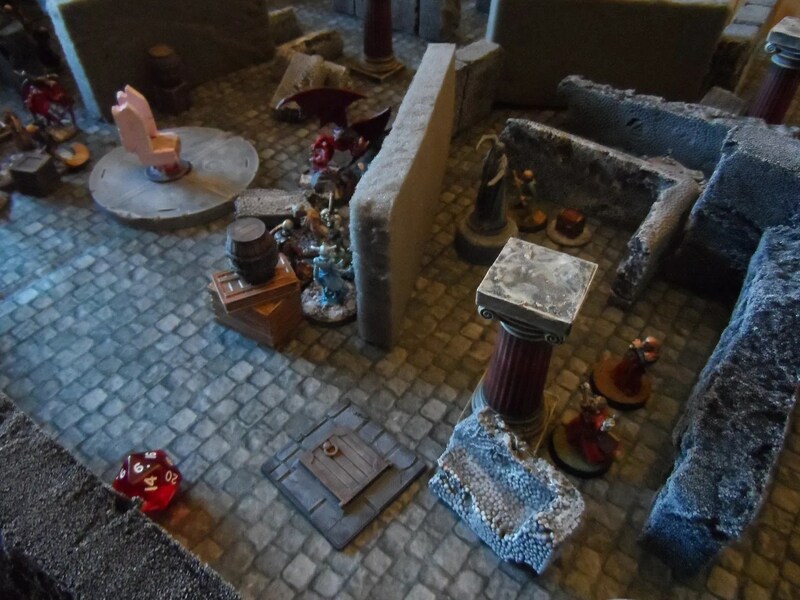 Next up, we had enough time to play The Dark Cauldron scenario. 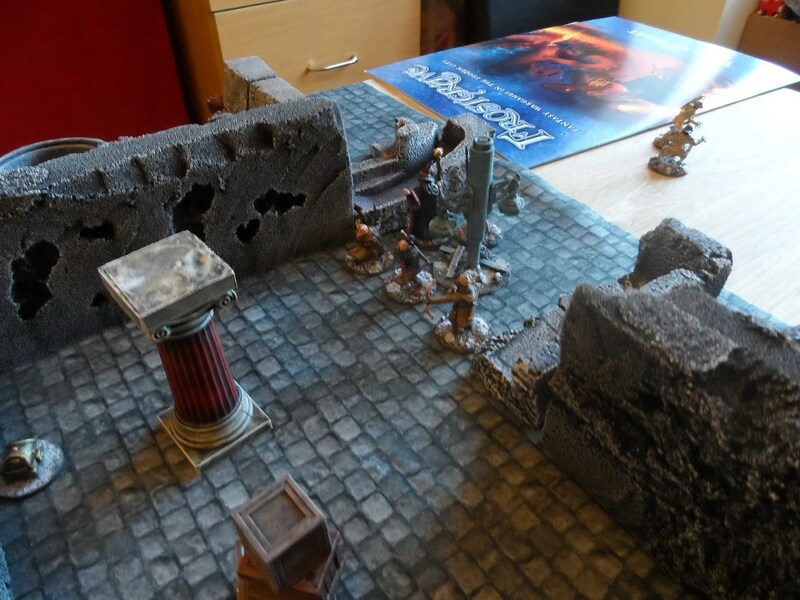 Another gaming session with Jon today, continuing our Thaw of the Liche Lord campaign. The foul Thaddeus’ war band (who are ALL EVIL AND MUST BE DESTROYED). 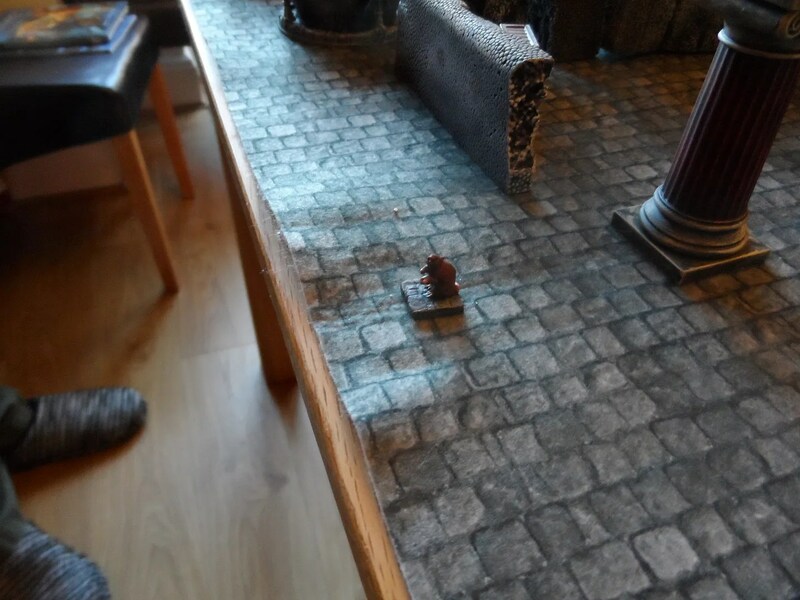 Whilst my thug wrestled the first treasure chest off the table, my knight stood on a trapdoor to prevent a ghoul appearing there. 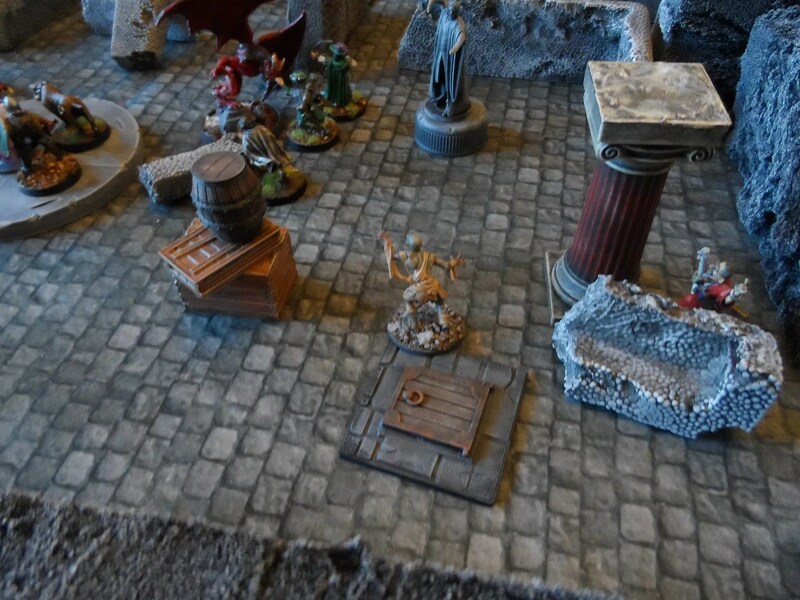 Unfortunately, the other thug and my apprentice didn’t have that luxury, and lo and behold, a ghoul appeared through this other trapdoor. 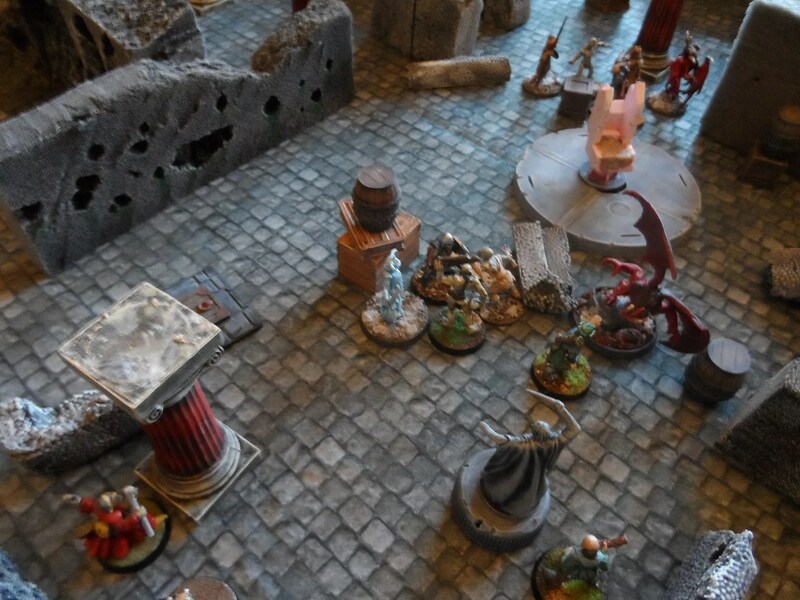 Thaddeus’ foul minions including a demon surged forward, and the Ghoul King leapt into action and confronted them. Meanwhile, a giant rat of the species Michaelus Govus appeared. 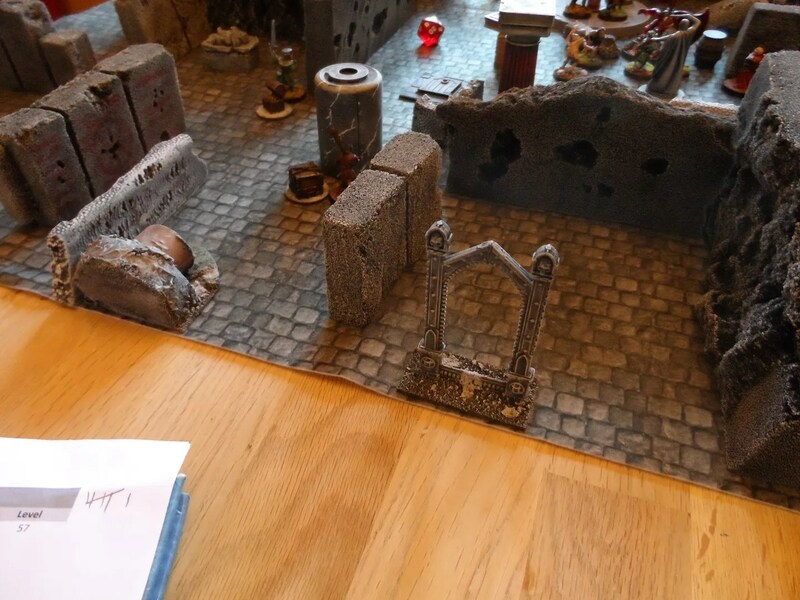 My Archer and two Rangers fired into the combat with the Ghoul King and actually brought him down ! As per the scenario rules, I dripped one of my new ghouls in behind Thaddeus’ lines to distract him. Unfortunately, I also got a ghoul pop up from the trapdoor (vacated as the knight was on treasure duties). 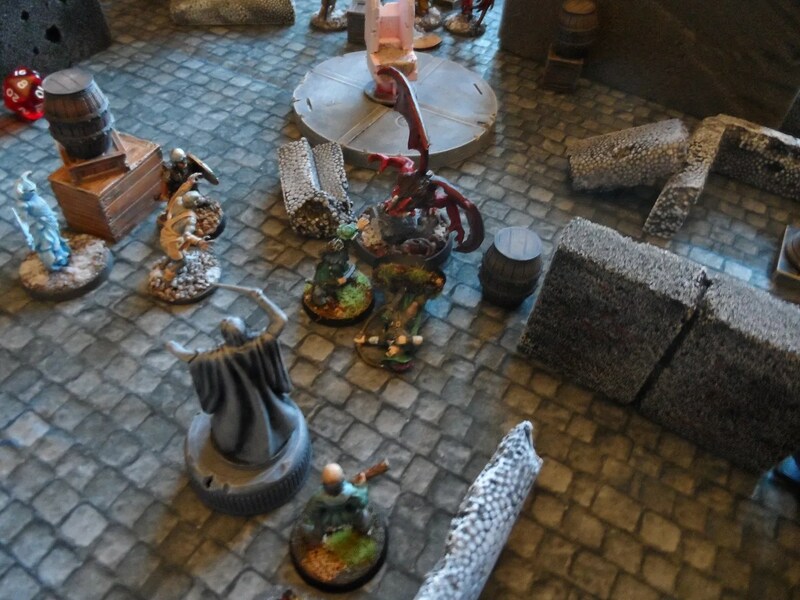 A big scrap broke out in the middle of the board, as Thaddeus’ demon (who was EVIL and needed to be destroyed), and the ghoul fought my archer and two rangers. 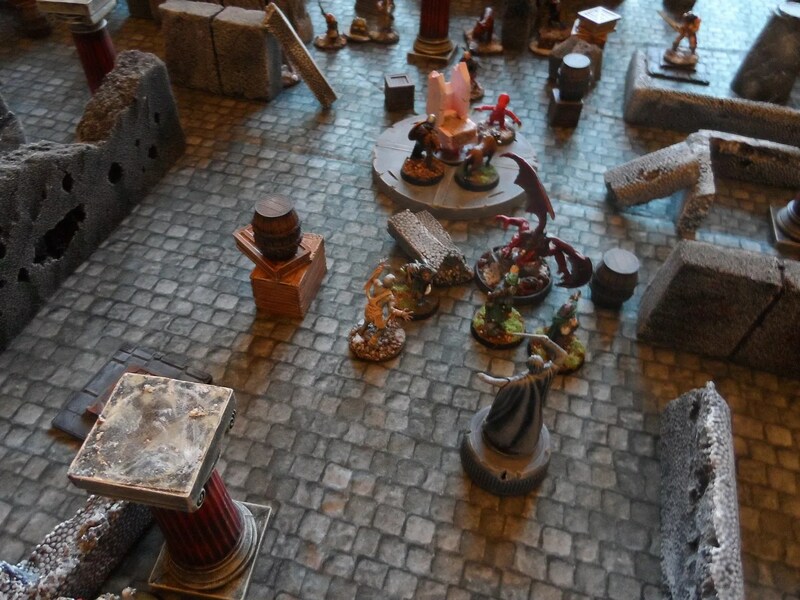 Meanwhile, my Captain had reached the throne and pulled the first lever, opening a portal behind Thaddeus’ lines ! The title says it all really, as usual climate change deniers are simply wrong on how the money from grant funds does not go in to the pockets of scientists. Whilst at Jim’s gaff, my mobile phone complained it had no juice, so I became a ‘leccy sponger and recharged it. 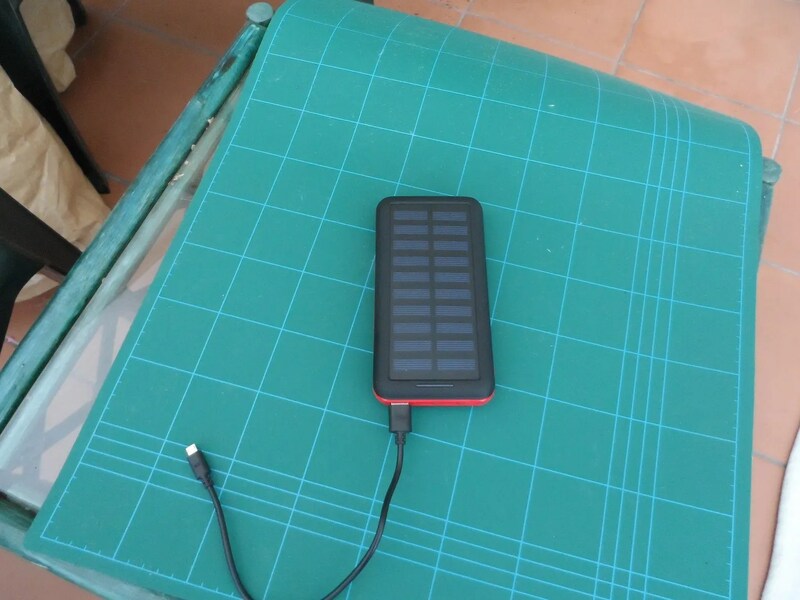 This reminded me that I’d intended to buy a solar recharger for my phone/iPOD/camera(Louis). Last time I’d checked solar chargers of this type were £75-£100. Ouch ! But solar cell prices have tumbled in the last few years. A quick cruise on Amazon and Sunny Jim was bought for £27, and delivered in 3 days. Despite it being mid November, overcast and raining, Sunny Jim recharged my mobile in less than 30 minutes, and today recharged my iPOD in less than an hour. Louis is stubbornly refusing to need to be recharged so I haven’t checked the time on that one out. This despite nay-sayers telling me solar doesn’t work in the UK in November. Now if we could only roll out solar panels on all roofs on new builds national we’d save a hell of a lot of CO2e emissions. 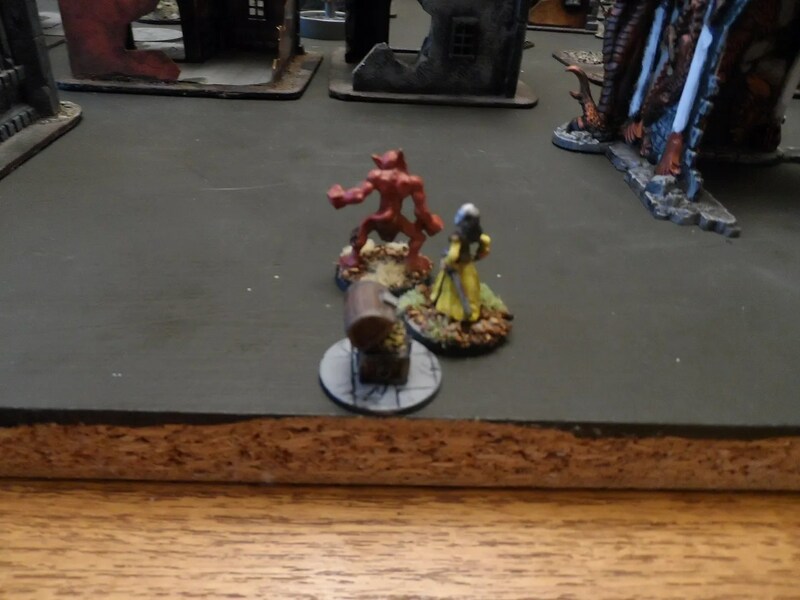 My Captain and Demon failed to kill off the Null man, and my Captain was down to 1 health. 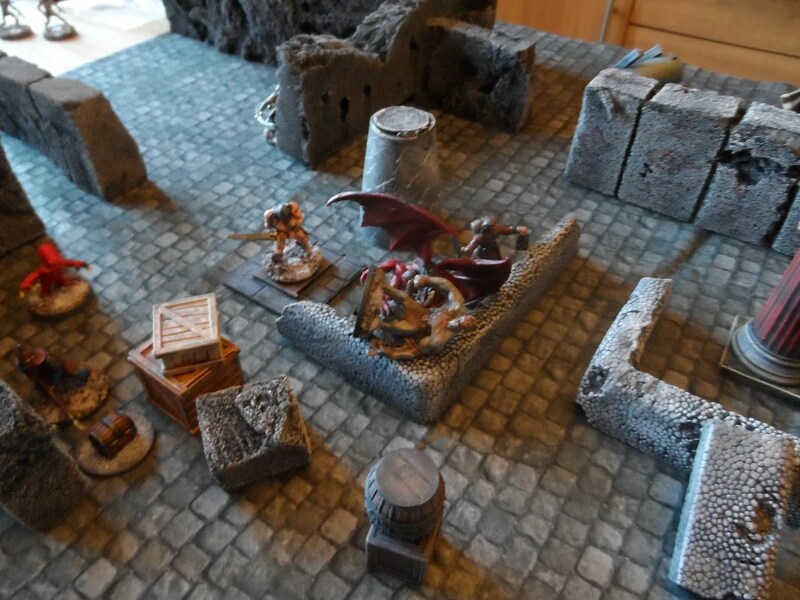 With another Telekenisis spell, KIY dropped the treasure chest at the edge of the table where Klotilda picked it up using the demon as a meat shield. Just as well, as another Null man distracted the possessed knight ! This time round, the tables were turned. KIY escaped with 7 (!) treasure chests. The 6 as per normal, plus a Reveal Secret spell. There were two Reveal Secret Treasure Chests as well. Plus a Fool’s Gold treasure chest, so yes the board was littered with treasure chests ! I stole one from Doozlebat with a well timed Control Undead spell. 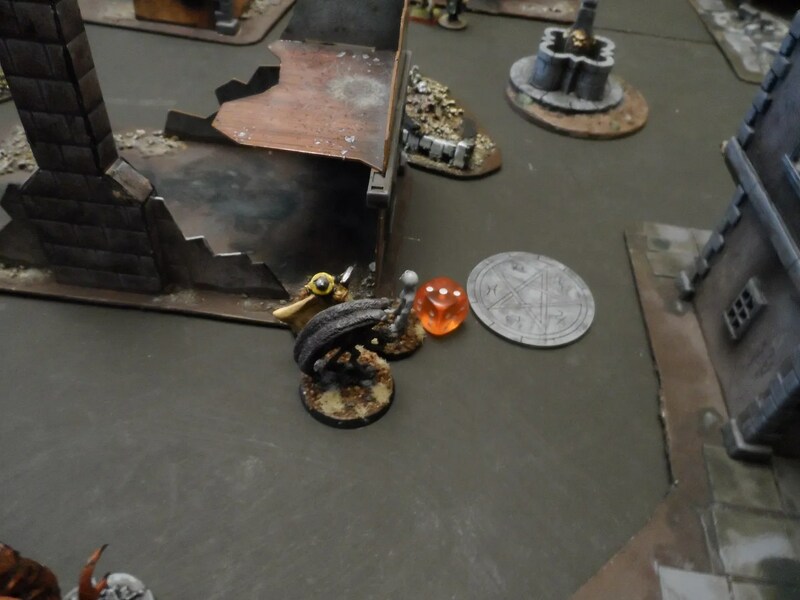 Jim had placed his Zoimbie and Reveal Secret treasure out on the flank, unfortunately I gained line of sight with Klotilda and walked the zombie off the table with the treasure and in to my clutches. A clever tactic, that I usurped by luck. 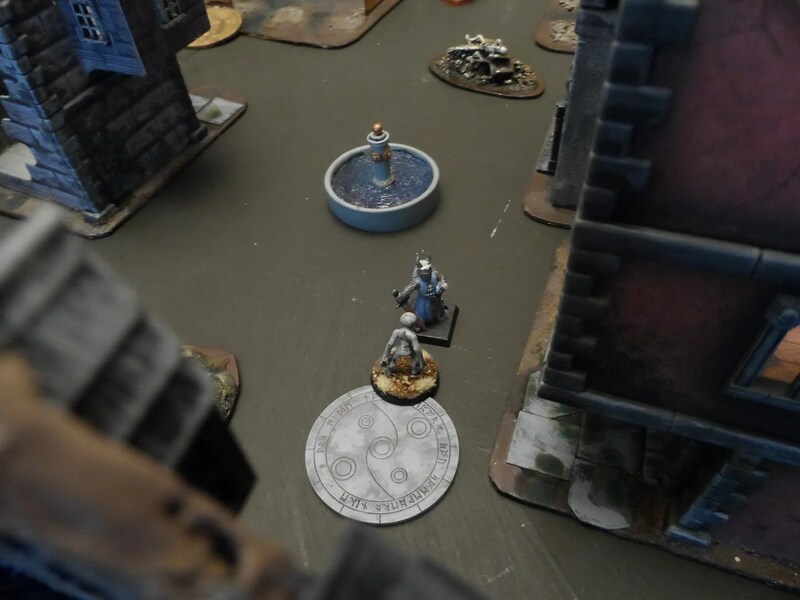 The scenario was very different, and on reading the exact XP rules after we finished, we found you had to cast five DIFFERENT spells to gain XP. Fortunately both of us had so Jim’s wizard Doozelbat did not go away entirely empty handed. Another good scenario that we hadn’t played before.